After a flurry of emails back and forth, I was connected to Chris van Lierop, whose parents were Rev. Richard E. Nelson and Mrs. Dorothy Rawlings Nelson. “I looked again at your website. Iron Crosses is in the background of the newspaper photo dated Feb 18, 1960. That article mentions Cedar Falls. I assume that my parents met Sister Mary James Ann at that time. My family moved to Duluth, MN, in 1964. Iron Crosses hung in our dining room there for 45 years! However, Chris did inform me that the painting in the background of this clipping is Iron Crosses, Bruges. I would have never known unless I saw the original! Iron Crosses, Bruges is behind my aunt on the wall. It is vibrant in reds, golds, oranges and pinks! News clippings provided by Clarke College (University). According to a 1960 article SisterJamesAnn_1960, my aunt was inspired to create this along with many other images during an art student tour of Europe. I also found this YouTube video searching for photographs. Not all of the images shown in this video are of crosses made of iron. Some ornate crosses are found individually on top of headstones, and this collection, set to lovely music, shows the same area photographed above, but dusted with snow. I think it sets a pensive tone. Chris is also going to try and find some old family photographs where the painting hung in the dining room! The painting was 48″ by 34″ tall. I will discuss the detail of the image at a later date here. Gosh I love the Internet! Comment: Hi, I happened across this work of art listed on the following web. As I found it interesting, I believed the seller misread the signature and I began a brief Internet search for Sister Mary Seraphia and found your website about your Aunt’s amazing work. Maybe it was one of her earlier pieces? I have been to An Orange Moon previously in search of mid century furniture. The owner is quite nice. I would be interested to see if this is one of your Aunt’s works. Good Luck! The ‘e” in sister closely resembles what should be the “e” not “c” in Seraphia/Scraphia. The handwriting looks like my aunt’s. How many nuns, with access to the Chicago area, who painted modern, abstract art in the 1950s and 1960s named “Seraphia” can there possibly be? This must be her! I never knew her to use her name in any of her artwork, nor did she use it in her personal correspondence with her family. She always used her official BVM name, either spelled out or initialed as SMJA. Just to be certain, I’ve searched the Web for any other possible explanation or identity for Mary Seraphia. I found a handful of nuns from different orders who went by this name, but none of them came from an art background, taught art, etc. Nor did I find any other work posted under Sister Mary Seraphia. I must draw the conclusion, that for reasons unknown, my aunt experimented with a pseudonym! The work is for sale and I have contact the owner, Lynne, of An Orange Moon and she has agreed to sell it to me at a generously fair price. 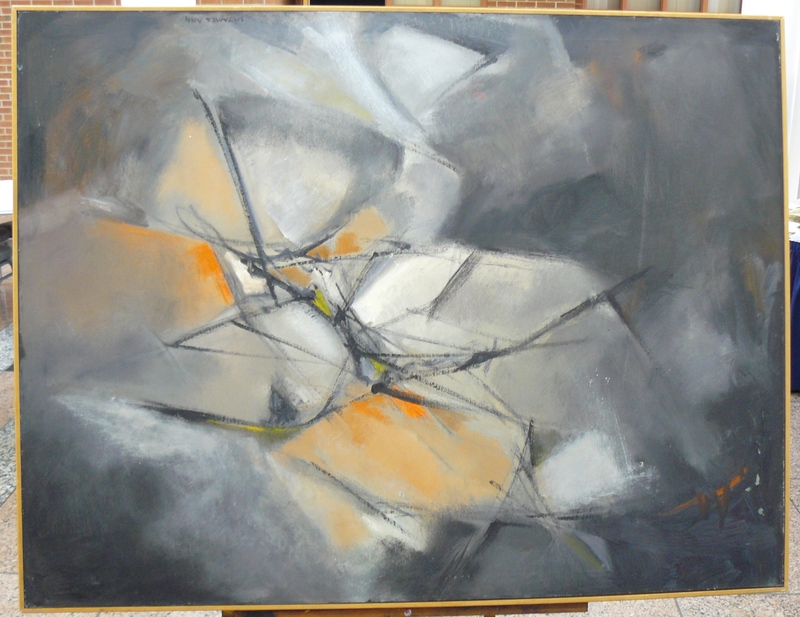 I am indebted to Lynne and to G. Walker who first told me about the painting being for sale. 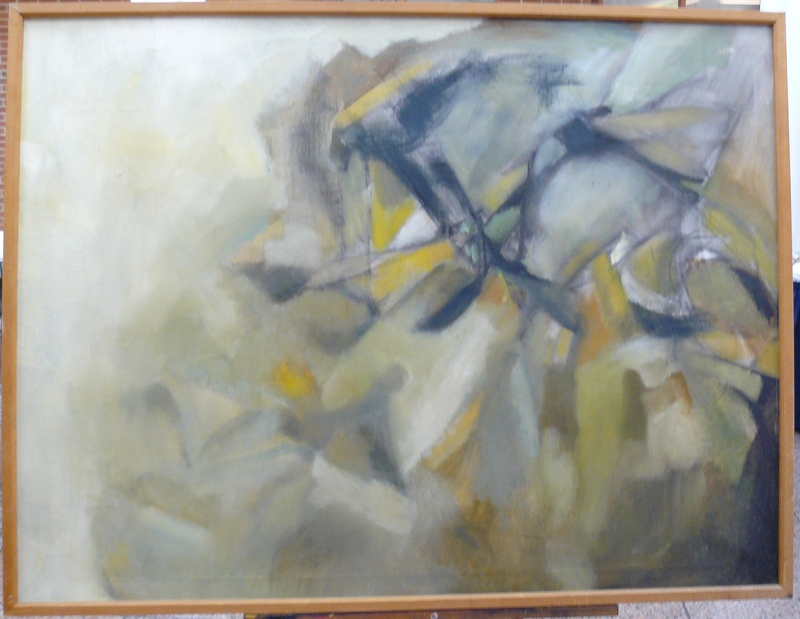 The owner is going to check for me how they acquired the painting. Lynne believes it came from an estate sale, as that is usually the source of her acquisitions. Whose estate it came form may provide very important clues to erasing any doubt this was done by my aunt. I am the proverbial 99.9 percent sure this is my aunt’s work! The painting is very large, around 3 feet, a format that my aunt favored. The heavy lines shaping the jugs and bottles are in keeping with much of the work I have posted on this site. She painted still lifes, and some are listed in the missing work page. My guess is that she may have painted this for someone she knew, someone who may have known her as “Seraphia” perhaps a family member. When my mother moved from Chicago to marry my father in Delaware, she lost contact with her Illinois cousins – so I have no contacts to ask or inquire on my behalf. Perhaps the back of the painting will provide clues. I do not have any closeups of her SMJA signatures. I have contacted Sr. Sara at Clarke with this news and perhaps I can get some side by side comparison’s of signatures. I am curious to know what those who knew her think! If Sister Mary Seraphia was her alias or pseudonym, it provides me with a whole new search criteria to explore and an opportunity to locate other missing work. If anyone knows of an entirely different person/artist known as “Sister Mary Seraphia” I would appreciate knowing so that I don’t pursue a detour or acquire any more paintings. If I am wrong about this, I’ll have a Picasso-eque piece to hang on the wall. But I think this was a safe investment, what do you think? Update 10/12/11: Lynn texted me and her records indicate the painting came from an estate in Bridgeview, Ill. I’ve never heard Bridgeview mentioned by my mother or aunt – I wonder if it was a family friend or a relative?I’ve asked Lynne to see who might have managed the estate sale and obtain a contact that may provide me with further clues. The painting is on its way to me and I eagerly await its arrival and placement in my home! The painting has arrived. Here I am with it hanging in my dining room. Like my mother, I think I am going to have to redecorate my room around this painting!